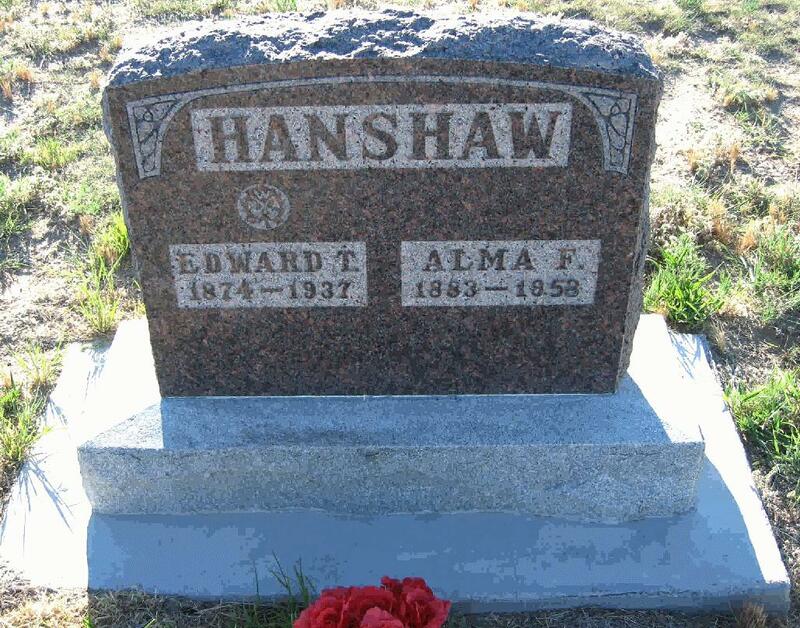 Edward T. Hanshaw1,2,4,5,6 [Thomas Henshaw7]. Hanshaw, E., head-of-household, age 24, born Aug 1875 in Indiana; father born in West Virginia; mother born in Ohio; single; occupation: farmer; rented farm. Hanshaw, Edward, head-of-household, age 35, born in Indiana; father born in West Virginia; mother born in Ohio; second marriage, married 10 months; 2 children, 2 living; occupation: real estate, real estate agt. Hanshaw, F. Alma, wife, age 26, born in New York; parents born in Canada; married 10 months. Hanshaw, Hattie L., daughter, age 6, born in Nebraska; father born in Indiana; mother born in West Virginia. Hanshaw, Nellie, daughter, age 4, born in Nebraska; father born in Indiana; mother born in West Virginia. Hanshaw, Andrew L., father, age 74, born in West Virginia; father born in Pennsylvania; mother born in Maryland; widower; 5 children, 4 living. Levrille, Mary L., mother-in-law, age 56, born in New York; parents born in Canada; divorced; 4 children, 4 living. Hanshaw, Edward, head-of-household, age 47, born in Indiana; father born in West Virginia; mother born in Pennsylvania; owned home; occupation: farming, stock farming. Hanshaw, Alma F., wife, age 36, born in New York; father born in Canada; mother born in New York. Hanshaw, Hattie L., daughter, age 16, born in Nebraska; father born in Indiana; mother born in New York; attended school. Hanshaw, Ethel L., daughter, age 9, born in Colorado; father born in Indiana; mother born in New York; attended school. Hanshaw, Allice M., daughter, age 6, born in Colorado; father born in Indiana; mother born in New York; attended school. Hanshaw, Claria E., daughter, age 5, born in Nebraska; father born in Indiana; mother born in New York; attended school. Hanshaw, Edward T., head-of-household, age 55, born in Indiana; father born in West Virginia; mother born in Ohio; first married at age 27; owned home; radio in home; occupation: farmer, farm; not a veteran. Hanshaw, Alma F., wife, age 46, born in New York; father born in Canada; mother born in New York; first married at age 24. Hanshaw, Alice M., daughter, age 16, born in Colorado; father born in Indiana; mother born in New York; attended school. Hanshaw, Clara E., daughter, age 15, born in Nebraska; father born in Indiana; mother born in New York. Carey, Frank D., head-of-household, age 54, born in Iowa; completed 4 years of college; on Apr 1 1935 was living in the same house; rented farm ($5/month rent); occupation: farmer, farm. Carey, Alma, wife, age 55, born in New York; completed 7th grade; on Apr 1 1935 was living in rural Yuma County, Colorado. 1910 census, Precinct 1, Laird, Yuma County, Colorado; roll T624-124, ED 293, page 108A, line #15, dwelling #27, family #27. 1920 census, Precinct 1, Laird, Yuma County, Colorado; roll T625-173, ED 272, page 2A, line #27, dwelling #25, family #26. Obituary of Ethel Louise Hanshaw. 1930 census, Precinct 1, Laird, Yuma County, Colorado; roll T626-252, ED 1, page 4A, line #47, dwelling #83, family #83. 1880 census, Aubbeenaubbee Township, Fulton County, Indiana; roll T9-0278, ED 37, page 6C, line #6, dwelling #105, family #105. Nebraska State Census 1885, ED 192, page 9B; http://www.ancestry.com. 1900 census, Highland Precinct, Gosper County, Nebraska; ED 75, page 65B, line #65, dwelling #63, family #63. Contribution from Deborah Burnett Overmyer. Ancestry Family Tree data "Burnett(1)" posted by "DDorscher". 1900 census, Highland Precinct, Gosper County, Nebraska; ED 75, page 65B, line #63, dwelling #62, family #62. Nebraska, Homestead Records, 1861-1936; http://www.ancestry.com. 1940 census, Douglas Township, Madison County, Iowa; roll T627-1179, ED 61-6, page 2B, line #49, household #35.